"'Crocodile Hunter' Steve Irwin killed by stingray." AP, 04 Sep 2006. "Your tributes to Steve Irwin." - CNN, 04 Sep 2006. "Irwin was one of the greats, says Bellamy." - The Australian, 04 Sep 2006. "Irwin in conversation." The Daily Telegraph, 04 Sep 2006. Transcript of interview with ABC TV's Enough Rope with Andrew Denton in 2003. "In pictures: Steve Irwin." BBC, 04 Sep 2006. I was offline but I received calls, sent and received several SMS' from wildlife film makers, animal handlers, reptile enthusiasts and naturalists. 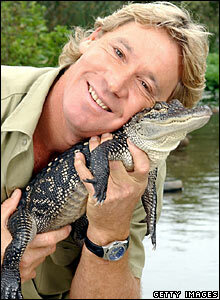 At the Singapore American School, I heard the audience talking about Steve Irwin as they settled down for my talk. I mentioned Steve's passing during the talk. Aussie news sites carrying the news went down, unable to cope with the surge in demand for news. Despite his life-threatening job, most of us were very shocked, sad and our hearts went out to his wife and kids. All these years and a stingray barb pierces his heart, so unexpectedly. Some of us wished he handled animals a little less, but all acknowledge this Aussie's significant contributions to conservation awareness - he reached millions and millions of people in their living rooms. He had a special gift with animals and an infectious enthusiasm. "This kid's got something." ""How come that kid never got killed by that brown snake?" And I guess he [Irwin's dad] figured it out then. He's figured, "This kid's got something." So, you know, he's watched this develop. Then Mum and Dad just propped me up. Just propped me up. Every time I'd make mistakes, they'd keep, "Hang in there, lad, hang in there." And they just kept helping me and persuading me to follow my passion, which was wildlife. And that, in essence, helped me be who I am." - Steve Irwin, during an interview in 2003. Crocodile Hunter has been temporarily suspended from Animal Planet's programming schedule for the moment, as a sign of respect to him and his family. Bye bye Steve. Thanks for all that enthusiasm. Grappling monitor lizards (Varanus salvator), Sungei Buloh Wetlands Reserve, 20 Feb 2006. Taken with a Panasonic Lumix FZ30. Double-click to play. Posted at 2:21PM UTC by N. Sivasothi | permalink | , .